A microwave or RF mixer will produce not only the desirable 1 RF x 1 LO frequency product, it will also produce every arithmetically possible frequency component. Any frequency expressed as m * LO frequency + n * RF frequency will show up as an output of the mixer. All products besides the desired 1x1 product are called 'spurious' mixer products, or spurs for short. As detailed in the Marki Microwave Mixer Basics Primer, most mixer circuits will suppress many of these spurious products. This application is designed to assist in identifying the presence and relative levels of each of these spurs in a given conversion scheme. The spur web will show what spurious products to expect in a basic conversion (up or down). The x-axis shows the input frequencies and the y axis shows the output frequencies. The frequency of a spur will increase n times as fast as the fundamental, where n is the order of the RF. A 1x2 spur will increase in frequency twice as fast as the desired 1x1 product. To use the Basic Spur Web input the IF (for an upconversion) or RF (for a downconversion). Enter the LO frequency next to the 'Current LO' box. Select whether the conversion is high side or low side if you would like the app to automatically update the frequencies. The app should automatically calculate the output band. The example below shows two methods of converting a 2-4 GHz IF band to a 10-12 GHz RF band. As the app shows, the difference frequency (high side LO) is preferred from a spurious standpoint as it has fewer in band spurious products, and they are at a lower level. If you are using a swept LO, or would like to see how the spurs change with different LOs, set the lowest and highest potential LO values in the LO Low and High Frequency textboxes. You can use the LO slider to move the LO up and down. If you have a constant input band, select 'Auto-Update Output Frequencies' to allow the output band to move as you change the LO. If you have a fixed output frequency, select 'Auto-Update Input Frequencies' to allow the input band to move as you change the LO. 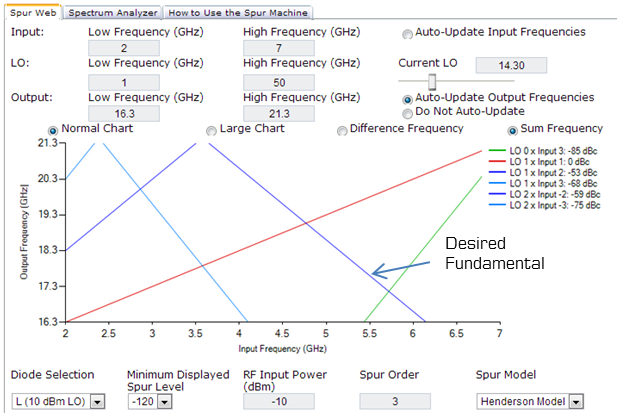 The 'Difference Frequency' and 'Sum Frequency' radio buttons indicate whether the spur calculator will use the sum frequency or difference frequency to calculate the input/output frequencies when 'Auto-Update Frequencies' is selected. Often we are interested in what products will be present when two frequencies are input to a mixer. 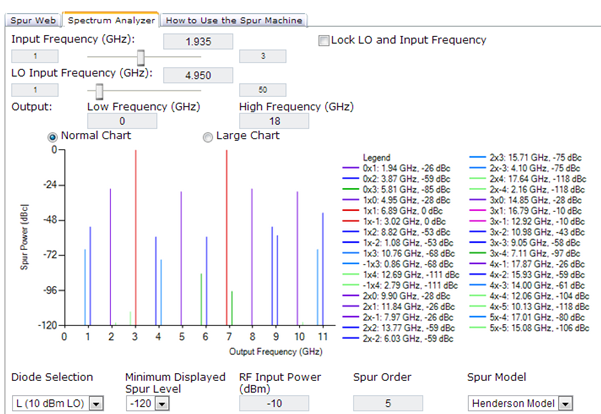 The spectrum analyzer view shows what the theoretical output of a mixer displayed on a spectrum analyzer if two given frequenciess were input to a mixer. 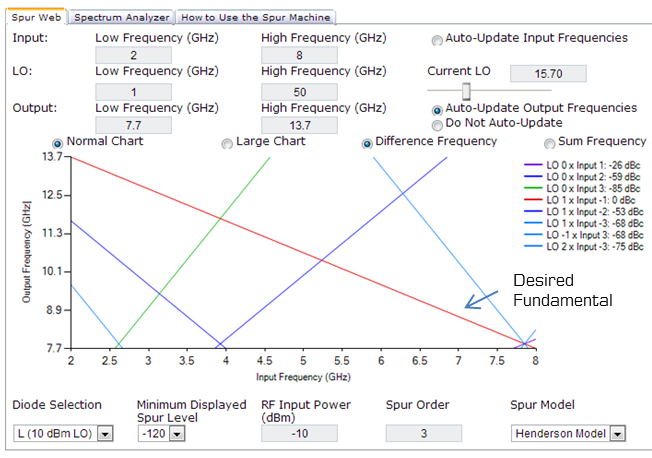 In this case there are two discrete input frequencies and the graph shows the location of different spurs at each output frequency, along with their power level (for more information on power calculation see 'Spur Power Calculation' below). In the example below we are trying to determine what all of the products would be if we input a 1.935 GHz IF and a 4.95 GHz LO into the mixer. In the first picture you can see that there are enough spurs to overwhelm the graphical display, so in the second picture we move to the 'large chart' format. In the output you can see the two main products at 3.02 and 6.89 GHz, as well as the leakthrough of the LO at 4.95 GHz and the RF at 1.935 GHz. The 0x2 and 0x3 products are the RF harmonics and the 2x0 and 3x0 products are the LO harmonics. The slider bars for the input and LO frequencies allow the user to see how the spur situation changes with changing input frequencies. 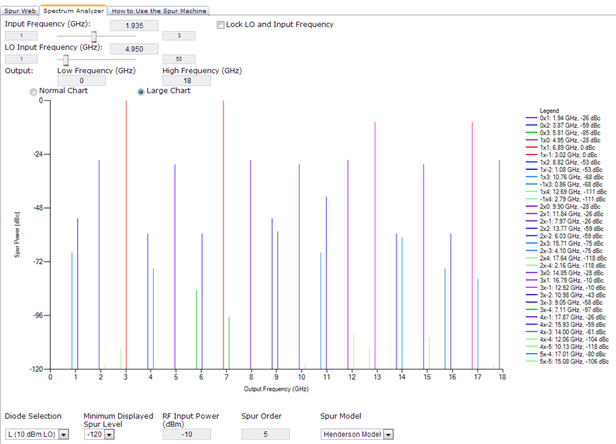 The 'Lock LO and Input Frequency' checkbox is useful for tuner applications where the output frequency is fixed, and the LO and input frequency are swept across some bandwidth. This checkbox will keep the difference between the LO and Input frequency constant as either of them is varied. The standard spur power calculation performed by the spur calculator is based on Bert Henderson's spur model for double balanced mixers ("Predicting Intermodulation Suppression in Double-Balanced Mixers", The Communications Edge, Vol. 10, No. 4, August 1983). It uses estimates of the standard balance of a double balanced mixer. These can be refined by selecting the diode level (and thus LO power level) and RF input power. In our experience the Henderson model is accurate to within 6 dB or so for most spurs on most double balanced mixers. The display can be adjusted by changing the minimum displayed spur level as well as the spur order. Spur Order determines how many products are calculated and displayed, and the calculator uses the same order for both input and LO.